Give a fabulous jewellery gift pack to someone special this year for Christmas. They will absolutely love the eye-catching colours and designs which will instantly add a splash of glamour to all their outfits. Light up your look with our shimmering nose stud pack which includes five glittering studs which you will love coordinating with all your favourite daytime and evening outfits. 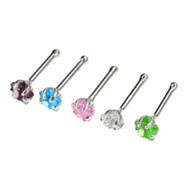 These gorgeous blue, pink, green, purple and white studs will look amazing in your nose piercing. Everyone will want this incredible bonus pack for Christmas and will enjoy teaming the coloured jewels with their shoes, bags and eye-catching makeup. They are made from shimmering silver which will feel comfortable and light on. You will love these wonderful nose studs if you love changing your appearance. Everyone will be impressed with your dazzling new look and will absolutely love this inexpensive body jewellery set. 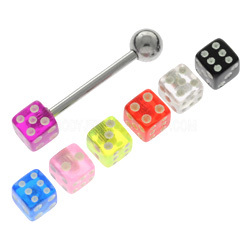 Add a splash of eye-catching design and colour to your look this year with our incredible tongue bar and threaded dice bonus pack. This surgical steel tongue bar will feel really comfortable on and will definitely light up your look. This pack also includes 7 Ultra Violet threaded dice which will look fabulous worn to parties, concerts and much more! You will love coordinating our pink, purple, blue, yellow, red, clear and black dice accessories with your glittering jewellery. You will really stand out from the crowd wearing this unique and glamorous tongue bar to all your daytime and evening occasions. This entry was posted in Balls and Accessories, Gifts and Accessories, Nose Piercings, Piercing Accessories, Surgical Steel Body Jewellery, Tongue Piercings and tagged jewelled nose stud, jewellery bonus pack, Nose Piercings, nose stud, nose studs, nostril stud, nostril studs, silver nose stud, Tongue Bar, Tongue Piercings on December 21, 2011 by Piercing Guru. With a host of stunning colours and designs our range of gorgeous nose studs will brighten your look wonderfully. Our selection of different materials and finishes gives you the freedom to create different looks, from bright and bold to pretty and subtle. If you have sensitive skin then we have a great range of materials that are highly biocompatible and can be worn by almost anyone. Add sparkle with a colourful jewel or glamorous character with a themed piece. Our fantastic prices mean you can afford to have a whole selection of fabulous nose studs for all different occasions. This pretty jeweled nose stud has an array of gorgeously bright sparkling jewels that catch the light beautifully. 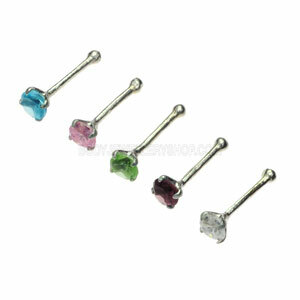 Featuring six jewels in, green, blue, pink, yellow, red and clear this nose stud instantly livens up your look. Made form surgical steel this nose stud will sit comfortably in you piercing without irritation. The smooth flawless finish brings a splash of elegant glamour to your look and will definitely get heads turning. The pretty floral design will look absolutely amazing with a range of different summer outfits. Give your piercing a colourful new look each day with this silver star nose stud pack. The pack consists of five nose studs featuring coloured star shaped jewels in, purple, pink, blue, clear and green. They have a pretty finish that will instantly brighten your look with subtle character. They are ideal for everyday wear and the stems are made from silver making them smooth and comfortable to wear. Suitable for healed piercings, simply insert for a secure elegant fit. This entry was posted in Nose Jewellery, Nose Piercings and tagged Body Jewellery, jewelled nose stud, Nose Piercings, nose stud, nose studs, nostril jewellery, nostril stud, silver nose stud on June 5, 2011 by Piercing Guru.